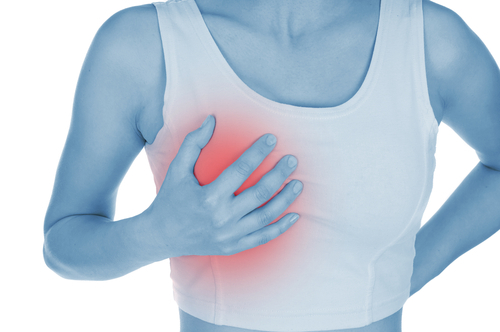 Breasts commonly feel sore or painful before your expected period date. This is due to the engorgement of the breasts, which increases their weight and size. Due to this increase, unpleasant sensations, such as soreness, can occur. These are signs that ovulation may have occurred. Additionally, these feelings will often occur during pregnancy due to high levels of the pregnancy hormone, progesterone. It is also possible for sore breasts to occur during and after the menstrual cycle. This is not an indication of pregnancy, but rather a potential indication of symptoms that may be caused by diet, hormones, stress or other causes. What follows is a common list of reasons that can cause sore breasts at unusual periods in time. Medically known as mastalgia or mastodynia, breast pain occurring before menstruation is common, yet a cause for concern among many women. Pain is often incorrectly self diagnosed as a more serious problem. However, as sore breasts and other pains can range from mild to severe and acute to chronic, it may be beneficial to speak with a medical professional. Breast pain during pregnancy, lactation and weaning are not unusual and therefore not associated with mastalgia. Both cyclical and non-cyclical mastalgia may be present, with cyclical mastalgia being the most common occurrence. Diet and exercise may be common factors in sore breasts at all times throughout the month. Additionally, hormones, chemicals, stress and other factors may influence these sore or painful sensations. During times of normal stress on the breasts, before menstruation and pregnancy, these pains can be magnified due to lifestyle and other influences. Vasodilators, chemicals that cause the dilation of blood vessels, may cause stretching, distention and stress. Because of this influence, pain and other unpleasant sensations may pronounced. If you find that you are excessively using these drugs or chemicals, then it may be beneficial for your health to reduce consumption. Water retention due to salts, inactivity or medical symptoms may cause breasts to become heavier and therefore painful. If you determine that your diet is rich in salt, then it may be advantageous to reduce your intake. Increased exercise may also reduce water retention. As exercise – as discussed later – may be a cause of breast pain, it is important to follow an appropriate course of action. Studies have shown that animal fat may be attributed to soreness in breasts. It is unclear whether the fats themselves are the culprit or if the animal hormones are the cause. Since potentially debilitating breast pain can have such an influence on your life, it may be wise to take a second look at meat consumption. Like animal fats, the reasons for the link between breast pain and dairy is not yet determined. Because of common agricultural practices, dairy animals may be supplemented with extra hormones to increase production. While dairy and dairy fats may be the cause of increased breast pains, it is also possible that these hormones and chemicals may be culpable. Reduce dairy consumption if you find that you are consuming it on a daily basis or in excess before you experience sore breasts. Excessive exercise may cause pain or soreness, especially in women with large breasts. Reducing exercise that causes stress here may be helpful. If it can not be avoided, such as for athletes or those who work in active environments, sports bras may take undue stress from the body. While beneficial for reducing the chances of pregnancy, birth control may have a strong impact on your body’s natural hormone production. Additionally, hormone therapy may be influential in the negative side effects of pain and displeasure. Speak with your medical provider about any concerns you may have regarding side effects. During times of hormone imbalance, such a puberty, menstruation, pregnancy and menopause, natural levels of progesterone and estrogen can be the cause of the sensations. While sore and painful breasts are normal during these times, the pain still may be unbearable. If symptoms persist for extended periods of time, then it may be wise to seek medical guidance. Stress can cause many problems people at all times in their life. Breast pain and soreness is not exempt from this potential cause. You may find that stress may be a catalyst for these sensations, so it is wise to reduce stress on your body and in your life when you notice bodily pain. There are many treatments from many cultures to relieve pain in the breasts. While it is acceptable to follow folk remedies, it is always favorable to make proper changes. Dietary changes, either eliminating negative foods or adding beneficial foods, will likely take some monitoring to determine its benefits. Exercise may also be a cause or help in regards to these pains. Medical needs may require an appointment or discussion with a doctor. – NSAIDs, nonsteriodal anti-inflammatory drugs, may be beneficial for sore breasts. – Oils and lotions, such as castor oil, may help by moistening the skin and relaxing the muscles. – Removing offending causes may be beneficial as well. This will target the root of the problem, rather than the symptoms. – Seeking medical advice from a professional.